Running an online business can be overwhelming. Need to find a way to save time and increase productivity? 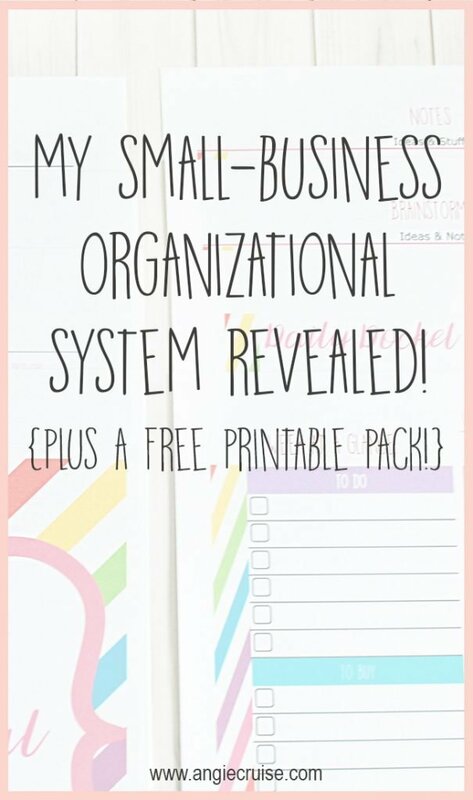 I’m sharing my small business organization system below! Read on for my best tips, and grab the very printables I use in my own business. When you first start out as a solopreneur, it can be hard to keep up with how many hats you are expected to wear. Having a small business organization system in place from day one can really help you stay on track, but it can be hard to know what you really need when you’re just starting out. It seems like so many of the big systems are geared toward corporations and larger businesses. What about those of us running a website from home? Or those of us still dealing with 10 customers a week instead of thousands? This post may contain affiliate links. To learn more, see my full disclosure here. I’ve been there. I’ve been in that place where I needed organization, but not something so in-depth that it required multiple spreadsheets and expensive software. New businesses have a budget! And it’s usually small. Not to mention, those systems can be really overwhelming for just one person. For an organizational system to work for you, it needs to be simple and easy to use. 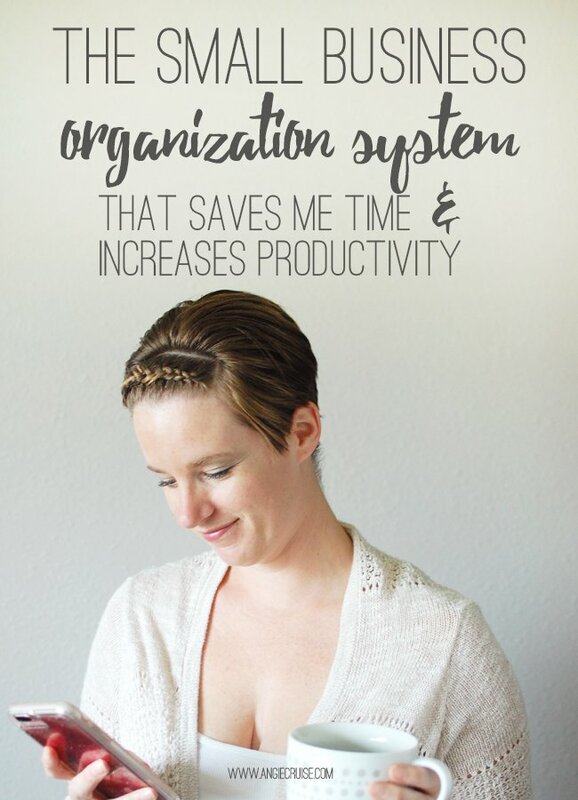 Over the years, I’ve developed a small business organization system for myself that really has helped me stay on task, plan content, manage my budget, and keep everything in one place. Have you been looking for a system like that? Update: I now have two free business planner printable packs available for all of your planning needs! This post features one, and you can find the other post right here! They’re a little different from each other, so check them both out and pick the one that meets your needs the best! What Are Your Organizational Struggles? When considering what you need in an organizational system, think about what it is that you need help keeping track of daily and find something that fills that need. If there’s too much to it, it’s more likely to be abandoned. So, do you need a place to organize all of your content ideas? A budget worksheet? Maybe just a place to prioritize your schedule? Seriously, how many website passwords do you have to keep up with? I know for me, personally, I have so many websites I log into daily. I have the admin page for my own site, paypal, all social media accounts, Evernote, Dropbox, my bank website, etc, etc, etc…. It’s just way too much to remember. I needed a place to keep all of that information in one (very secure) place. Having all of my login information for each website I use has been a huge help. I used to have to reset my passwords constantly! 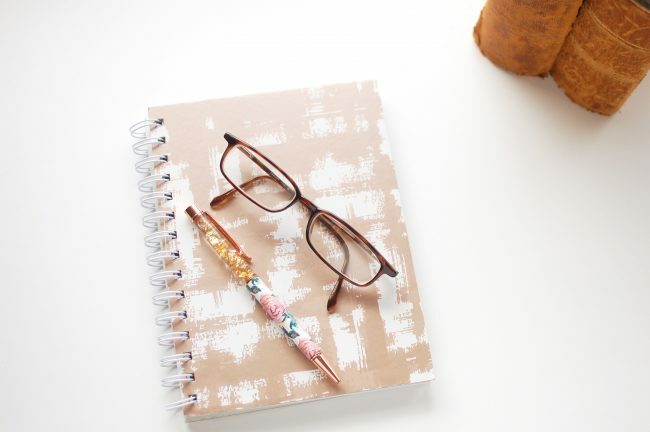 When I first started out using a good planner, I thought it would answer all of my productivity needs. I was using an Erin Condren at the time, and kept trying to find a way to keep all of my commitments in one place. As I’ve said before, I’m a mom, a busy volunteer, and run a business from home. 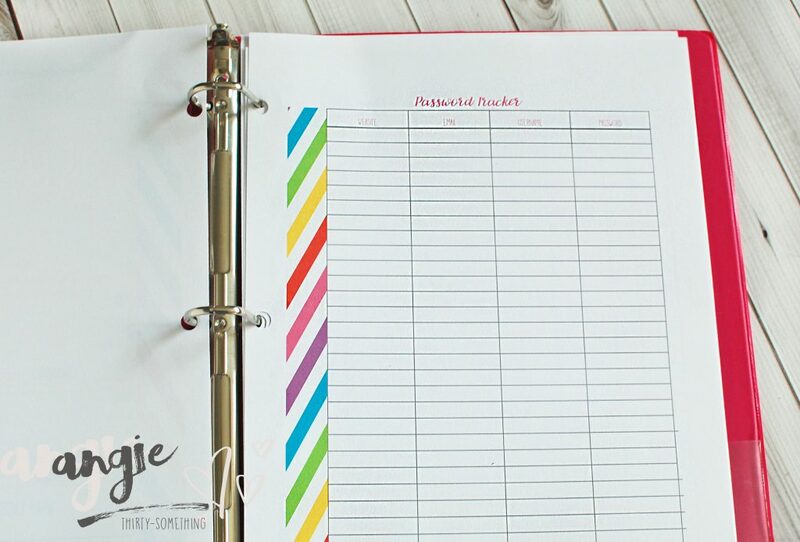 My planner pages were so cluttered that I would lose track of everything I needed to do! Now, I keep all of my business plans in their own place. I’ll block out time in my normal planner for blog and business work, but the really in-depth stuff has it’s own place. 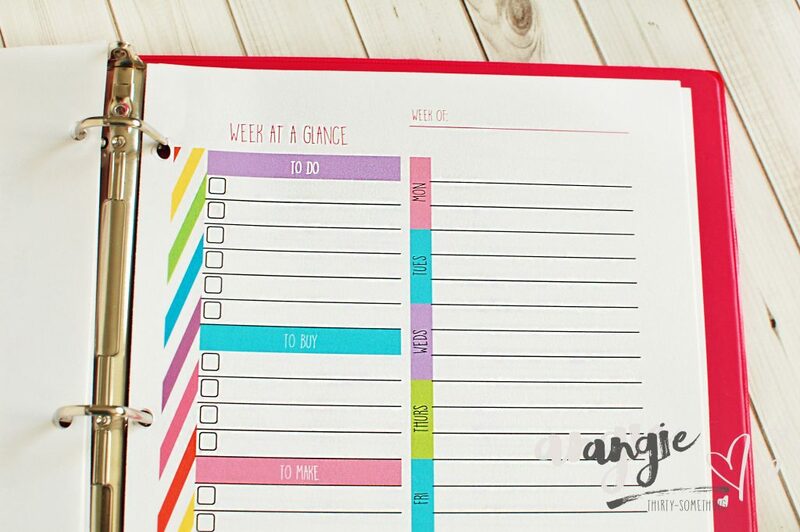 For my business, I created a “Week at a Glance” planner page as well as a “Daily Docket” planner page. The two sheets together help me keep my business organized and on task. With the week-at-a-glance sheet, I’m able to write out the priorities for the whole week, as well as keep a list of supplies I need to buy and products I need to make. The Daily Docket page gives me a full scheduling space, a spot for notes, and a spot to mark my top priorities for the day. I never know what to put on social media! Social media marketing is a beast. If you have a small business, you already know this. What will get engagement? Are you varying your content enough? Are you sharing things your readers will enjoy? Many times, I’ve found myself just not posting on social media, because I get tired of posting the same things over and over. While I am a big believer in starting small and focusing on just one or two platforms, it can still be overwhelming to come up with content every day! 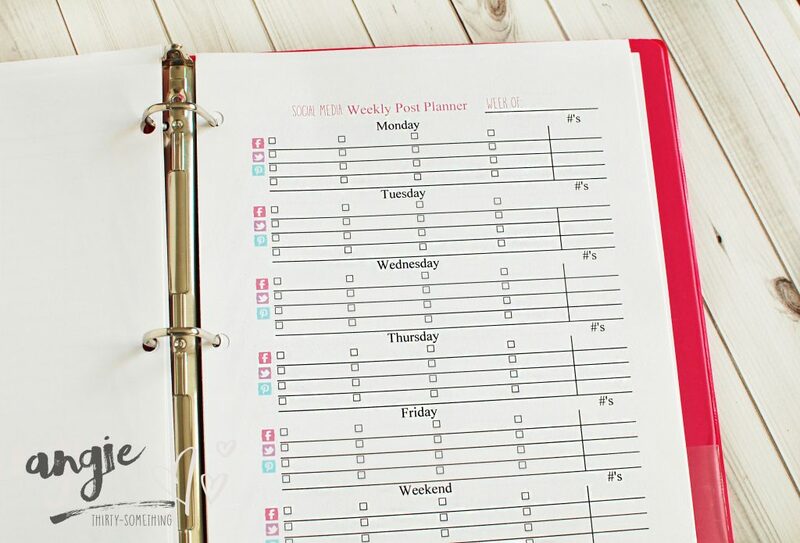 Having a social media post planner has been the best thing I’ve ever done for my business to date. I’m able to sit down on Friday and plan out content for each of my platforms for the entire week. This helps me to be sure that I am varying my content each day and sharing new and interesting things, plus, I can track my engagement so I can see what sort of posts do the best with my fans. Once I’ve got everything planned out, I’m able to get all of my photos and links in order and hop over to my scheduling app and schedule out my posts for each platform. I personally use Buffer right now, but CoSchedule is another great tool for scheduling social media posts! Just a note on scheduling Facebook posts: from what I can see regarding Facebook’s algorithm’s, they really don’t like it when you use an outside scheduler, and will punish you by limiting your reach. I personally prefer to schedule out my posts for Facebook using their own post scheduler. Do You Need a Small Business Organization System? It’s no secret that I love printables. I designed all of these that you see in this blog post, and would love to share! I took a look at exactly what I use in my blog and my business, and decided to put together a fun and colorful starter pack to share with my readers. Click here to get your own FREE copy of my small business organization starter pack! I’d love to give you a copy of this organization pack! It’s in my resource library as a free download. You can gain access to that by subscribing to my newsletter right here. Do you struggle with finding a small business organization system to stay productive and on task? What is your biggest challenge when it comes to organizing your business or blog? Let me know in the comments below, or join the conversation on Facebook! Great post… time for me to get organized as well. I ordered a new planner (late, I know) and it’s coming today! Perfect timing on this post. Thanks. Hey Jen! Don’t feel bad. I still need to order a 2017 calendar. Haha! I have an academic year right now, but it just doesn’t feel right! I’m glad you enjoyed the post! I loved this post. I’ve slowly been working on getting back into Arbonne and am still looking into a way that its still fun and organized. Thank you Mihaela! I’m glad you like it, and good luck with your ARbonne biz! i am trying to download the small business printable but its not downloading. I have clicked the link and recieved an email to subscribe the list > I have done the same but its still not leading me to anywhere and the same thankyou page is opening again and again. Hey! Did you get your welcome email? The link to download should be in your email. Try looking in your spam or junk folder to see if it’s in there! Sometimes they get filtered! Same here. There’s no link in the email I’m receiving. How do I get the free printables? Hey Rachelle, the link for the printables will be in your first email! Hi Nash, have you received your welcome email? The link to the printable library is in that email. Be sure to check your spam folder if it’s not in your inbox. Sorry you’re having trouble!